Overall Size: 9 3/16" x 13", Check Size: 3 1/8" x 7 7/8", Stub Size: 3 1/8" x 5 1/8"
Multi Purpose Voucher Checks are your best option for manual business checks with the most flexibility. 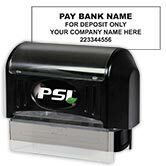 These checks are excellent for payroll checks, or for use paying invoices. The detachable stub includes plenty of room to accurately record invoice payments, and also breaks down the different payroll deductions. Why mess with different kinds of business checks when you can take care of it all with our multi-purpose manual checks? 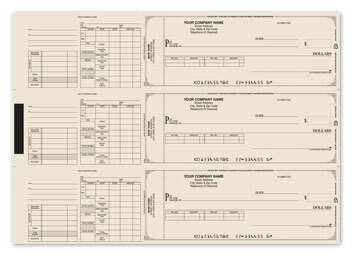 Order your Multi Purpose Voucher Checks now and make these multi-tasking checks work for you! A 7 ring check binder is not included with your 3-on-a-page checks, but you can easily add one to your order. You can also order one of our Business Check Kits and get everything you need to start out strong.